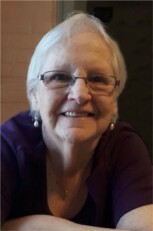 Peacefully at home on April 3, 2019 she went to the big sewing room in the sky. Survived by her daughter Mary (Steve), grandchildren Jake (Alexis) and Cas. Great grandchildren Macy and Brayden. Siblings Jean (Murray), Reg (Dorothy), Marge, Doris, Ron (Sandi), and Lois. As well as many nieces and nephews. A special heart felt thanks to our St. Elizabeth nurse Holly. Your help and compassion went above and beyond. We will always be grateful for that. And to Jeannie, my sister in spirit, we never would have been able to keep Mom at home, like she wanted, if not for you. Your love, compassion and caring has made all the difference. We will forever love you for it. As per Barb’s wishes, there will be no services held. If desired, donations may be made to the Canadian Diabetes Association, or Princess Margaret Hospital. Condolences received atwww.MacCoubrey.com.